The moringa plant, which is also called the drumstick tree, is named ‘kelor’ in Indonesia. 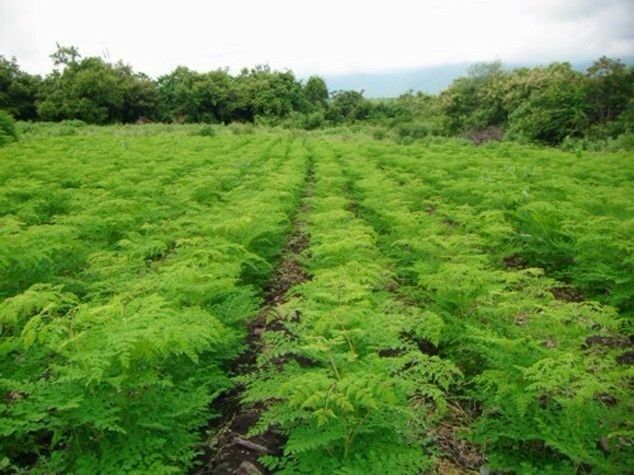 JAKARTA, Indonesia – East Nusa Tenggara (NTT) Governor Viktor Bungtilu Laiskodat has announced that his administration is encouraging the production of moringa liqueur, which experts at Nusa Cendana University (Undana) are currently researching. “We are encouraging research on developing sopi [a type of traditional liquor], including sopi that uses raw ingredients from the moringa [plant],” said Victor as quoted by kompas.com. The governor attended a ceremony on Monday at which Undana rector Fredrik Lukas Benu signed a memorandum of understanding (MoU) to start production of Sophia, the branded name for the moringa liqueur. Sophia is to be produced in cooperation between the university’s business school and a local company. “We will name all NTT liquor products Sophia – Sophia 1, Sophia 2, and so on. The [products] include the one that uses moringa as a raw ingredient,” said Viktor. He added that Sophia would compete with traditional liquors from other regions, including Cap Tikus from Manado, North Sulawesi, and that the province’s liquor products would be exported to Timor Leste and Australia. The Sophia liquor was produced from palm wine, which would be purchased from local suppliers that used traditional methods, said Viktor. “Sophia has an alcohol content of 45 percent [90 proof]. Initially, we will produce 12,000 bottles of the liqueur,” he said. The moringa liqueur is planned for launch in June 2019 at Rp 1 million (US$70.22) per bottle.